The sun shone brightly and the temperature was comfortable Sunday, not unlike the tragic morning of Sept. 11, 2001, when four hijacked jetliners commandeered by terrorists set out to destroy America's icons of finance and government. Hearts over the loss of nearly 3,000 people that day remain heavy 10 years later, but the Interfaith Service of Remembering, Respecting, Renewing held Sunday afternoon on Fairfield's historic Town Hall Green reminded more than 200 people in attendance that hope lives and that America's greatest strength, its unity, thrives. Fairfield Police Chief Gary MacNamara said many memorial ceremonies commemorating 9/11 took place throughout the state on Sunday but, "This one is one of the most important because this is an interfaith service." "If we don't have community we don't have anything," said Ina Chadwick of Westport, just before the service began. The event was marked with music, readings of sacred text from Christian, Jewish and Muslim faiths, and a moving remembrance of the 152 victims who either lived in or had ties to Connecticut. Before the service began, the Rev. Alida Ward, co-pastor of Greenfield Hill Congregational Church, invited the audience to participate in an "act of remembrance" by selecting a stone bearing the name of a Connecticut victim -- among them, Adam Lewis of Fairfield -- who died in the south tower of the World Trade Center. 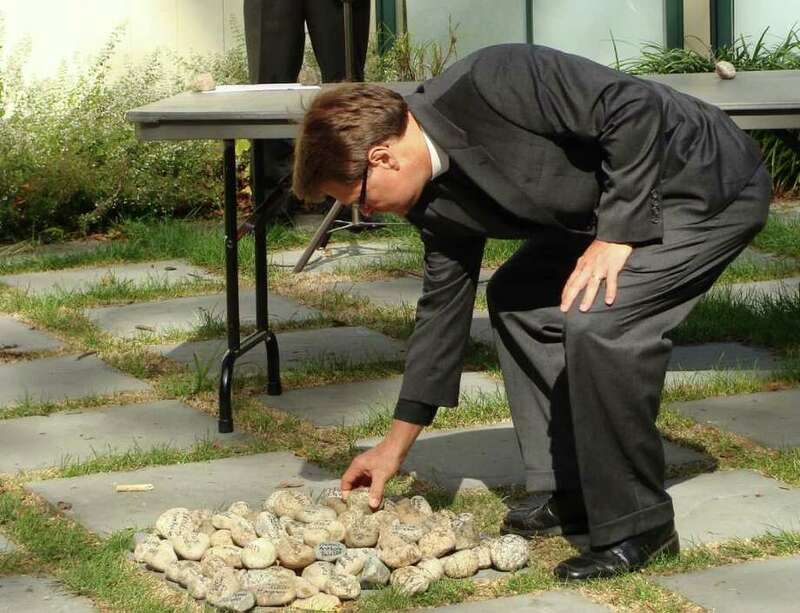 As each victim's name was read by one of seven religious leaders who took turns reciting the names, the person holding that stone brought it forward and placed it on the ground. Nina Soalt of Fairfield kissed her stone before adding it to the pile. On that stone was the name of Edwin Graf III. Although Soalt did not know Graf she said she felt compelled to kiss his name "out of honor and respect" and for those members of his family who cannot kiss him any longer. "I picked him on purpose because he was the third. I thought about his legacy," Soalt said. Diane Kulungian-Halabi of Bridgeport, a Muslim, also carried a stone to the pile. "I thought it was important because I am a Muslim and I wanted to make a showing to show that I care," said Kulungian-Halabi, who said the aftermath of 911 was a difficult time for Muslims, which continues today. "Some people still don't understand. I get second looks," she said. "Islam is totally against terrorism." Nancy Roche of Fairfield took the stone with the name of Scott O'Brien. "I didn't know him. I'm going to pray for Scott and his family," said Roche, who wore a red, white and blue scarf. Rabbi Jack H. Bloom recited his poem, "Remember Our Names." Imam Nasif Muhammad read a sacred passage from the Koran. The Rev. Matthew Calkins, rector of St. Timothy's Episcopal Church, read a Litany of Remembrance calling on those gathered to say out loud together "We ask that the sorrow of our remembering today may lead us into a greater compassion, a deeper hope and a renewed commitment to work for a world freed from terror and at peace." Juliette Brisman Zuckerman of Fairfield served as an example of healing and hope after unimaginable tragedy, revealing in her speech that she is a 9/11 widow who has since remarried. Her first husband, Mark Brisman, died in the attacks on the World Trade Center. "Our world was turned upside down and I wondered how it would ever feel normal again ... With all the new blessings that God has bestowed upon me, I never thought that I would be lucky enough to find a second chance at love," said Zuckerman, who had also attended ceremonies Sunday for dedication of the memorial on the site of the former trade center in New York City. Before and after the Fairfield interfaith service, people were given a chance to reflect on the events of Sept. 11, 2001. Inside the Fairfield Museum and History Center, they could to participate in Listening Circles to share their stories, memories, sorrows and hopes. Visitors also viewed a two-part exhibit that includes photographs, art work, a memorial message book, printed material, a list of all the Connecticut victims and the towns from which they came, and a computer to look up images and information about that fateful day. The exhibit, "Connecticut Responds and Reflects," which will remain on display at the museum until Sunday, also includes photos taken by Westport photographer Stephen Wilkes on and shortly after 9/11. Among them are images of "found memorials" -- an American flag inscribed with messages of hope and despair, messages written in ash from the World Trade Center buildings, a charred family photo, and an ash-covered New York City police vehicle. It also features a photo Wilkes took of ground zero one month after the attacks. "This photo of ground zero has never been exhibited before. It's an important image because, for him, it takes the visceral reality of the scene and imbues it with a sense of hope and spirituality," said curator Kathie Bennewitz. Laura Jenkins, 22, of Coeur d'Alene, Colo., a volunteer at the Wakeman Boys and Girls Club, said the entire exhibit had an element of spirituality, "which I think is essential to something of this gravity." "This is something that will live with each of us forever," said interim First Selectman Michael Tetreau, who used to work at the World Trade Center. Tetreau said the event not only commemorated the 152 Connecticut victims of the Sept. 11 terrorist attacks, but also honored all police and fire personnel. He also asked the crowd to remember those in uniform who protect the nation at home and on foreign soil. "Take every opportunity you have to say, `Thank you,' " Tetreau said. Thirteen-year-old Tess Shinbaum, of Fairfield, said the commemoration "seemed like something nice to do for the people who lost their lives. They were innocent." "Our remembrances shape who we are and what we do," said Bob Hillman of Trumbull, who also attended "to help people who mourn so they know they're not alone." U.S. Rep. Jim Himes, D-4, could not attend the Fairfield service, but sent remarks that concluded, "Perhaps we honor them best by remembering also that gift from the ashes, that reminder of our common humanity."